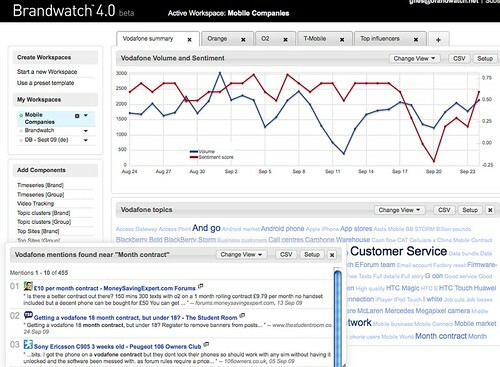 3 years ago we started building Brandwatch on top of the search engine we had developed. We asked prospective users what in particular they wanted from a system that ‘told them what people were saying about them on the internet’. The typical response we got was ‘sounds cool’ or at the most ‘yeah that would be really useful’. What, of course, I was really after was to find real pain. The kind of I can’t stand up cos my left foot feels like it has been jumped on by an elephant type of pain. Or in the corporate world, something like, ‘we’re losing customers to our competitors and we don’t really know why, but we think it’s x,y,z….’ That sounds painful and if we take away that pain, they would most likely pay handsomely for it. Fast forward 3 years, and nowadays there seems to be a whole industry in our space and it’s a really messy, confusing, interesting, exciting place to be. There are paid services like ours, Radian6, Scoutlabs and plenty of others, but even doing a price comparison between them is hard. And Microsoft has announced its arrival with Looking Glass. So it goes – things get more complex before they get simpler. So, is there a big play in all this somewhere (yeah, i know ‘big play’ sounds w**ky, but you know what i mean). The big answer is, no-one knows right now, but there is static in the air. People in and around the sector expect something pretty big to happen. It feels like lots of rivers coming together and there is turbulence, but it looks like something with real momentum and power could emerge. As evidence for that, we’re getting inbound VC enquiries every month at the moment. No kidding. INBOUND. It’s flattering, but I’m glad to say that we are making profit now, so it’s not something that’s on the near-term horizon. What happens next and who wins? So assuming 1 to be true and 3 to be something that will be solved across the market at some point, 2 is the key differentiator. As it should be.